Reprint. Reading level guidance book band. Originally published: 2018. 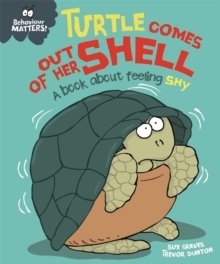 This funny, charming story is the perfect way to introduce young children to being brave when they feel shy and help them find ways to feel more confident. Also included are suggestions for activities and ideas to talk through together to help children fully understand how their behaviour can impact on others. Turtle has a beautiful singing voice, but she feels far to shy to enter the talent show at school. By talking to her friends about it, she develops a way to overcome her shyness in a way that works for her. The Behaviour Matters series of picture books provide a gentle means of discussing emotions, boosting self-esteem and reinforcing good behaviour.